EXECUTED BY LETHAL INJECTION ON JANUARY 27, 2006 1:17 A.M.
Summary: Bieghler was in the business of buying and selling marijuana. Tommy Miller sold drugs for Bieghler. After one of Bieghler’s chief operatives was arrested and a large shipment seized, he suspected Miller of “snitching” on him. Bieghler and his bodyguard, Brook, drove to Miller’s trailer near Kokomo, and while his bodyguard waited outside, Bieghler went in and shot both Tommy Miller and his pregnant wife Kimberly with a .38 pistol. A dime was found near each body. He was later arrested in Florida. Brook cut a deal and was the star witness for the State at trial. While the gun was never recovered, nine .38 casings found at the scene matched those found at Bieghler’s regular target shooting range. Trial:	Information/PC for Murder filed (03-30-82); Amended Information for Death Penalty filed (04-12-82); Motion for Speedy Trial (11-29-82); Voir Dire (02-02-83, 02-03-83, 02-04-83, 02-07-83, 02-08-83, 02-09-83, 02-10-83, 02-11-83, 02-12-83 ); Jury Trial (02-14-83, 02-15-83, 02-16-83, 02-17-83, 02-21-83, 02-22-83, 02-23-83, 02-24-83, 02-25-83, 02-28-83); Deliberations 13 hours, 10 minutes; Verdict (03-01-83); DP Trial (03-03-83); Deliberations 11 hours, 55 minutes; Verdict (03-03-83); Court Sentencing (03-25-83). Pivarnik Opinion; Givan, Debruler, Prentice concur; Hunter not participating. Bieghler v. Indiana, 106 S.Ct. 1241 (1986) (Cert. denied). 05-25-90 PCR Petition filed; PCR denied by Special Judge Bruce Embrey 03-27-95. Affirmed 5-0; Shepard Opinion; Dickson, Sullivan, Selby, Boehm concur. Bieghler v. Indiana, 112 S.Ct. 2971 (1992) (Cert. denied). 01-20-99 Petition for Writ of Habeas Corpus filed in U.S. District Court, Southern District of Indiana. 07-07-03 Petition for Writ of Habeas Corpus denied. Bieghler v. McBride, 389 F.3d 701 (7th Cir. November 18, 2004) (03-3749). Affirmed 3-0; Terence T. Evans Opinion; Michael S. Kanne, Ilana Diamond Rovner concur. BIEGHLER WAS EXECUTED BY LETHAL INJECTION ON JANUARY 27, 2006 1:17 A.M. 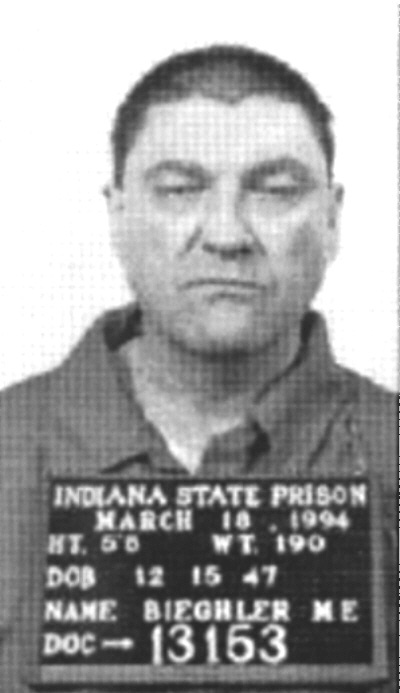 HE WAS THE 87TH CONVICTED MURDERER EXECUTED IN INDIANA SINCE 1900, AND 17TH SINCE THE DEATH PENALTY WAS REINSTATED IN 1977.